For millennials, out-of-wedlock childbirth is the norm. Now what? 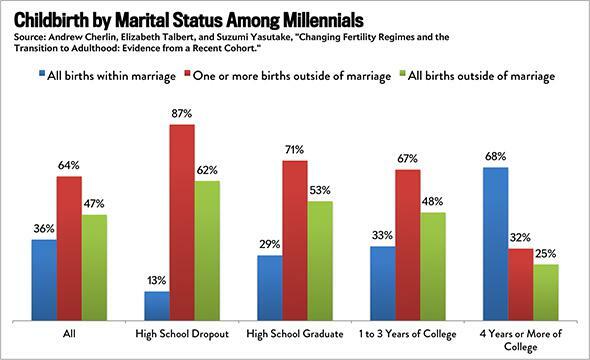 Among women under 30, more than one-half of all births happened outside of marriage. Above, newborns at the New York University Medical Center in New York City. Instead of continuing to talk about ways to reduce the number of single mothers in the United States, maybe it’s time to think of ways we can make their lives a little easier. Because so far as prevention goes, it’s starting to feel like that ship has sailed for now. This month brings us yet another reminder that, for young Americans, having children outside of marriage is very much “the new normal,” as the New York Times once put it. In a study tracking the first wave of millennials to become parents, a team from Johns Hopkins University recently found that 64 percent of mothers gave birth at least once out of wedlock. Almost one-half had all of their children without ever exchanging vows. The findings echo a separate study from 2012, which found that, among women under 30, more than one-half of all births happened outside of marriage. This new paper analyzes results from the National Longitudinal Survey of Youth, which began interviewing thousands of young Americans annually starting in 1997. Using data from 2011, when the subjects were between the ages of 26 and 31, it reveals a by-now familiar story about how, when it comes to raising family, America is really two separate countries divided by education. Four-year college graduates waited until later in their 20s to have children, and were typically married by the time they did; less than one-third gave birth out of wedlock. Women without a bachelor’s degree had children earlier, and were typically unmarried—74 percent gave birth at least once without a husband. Not all of those mothers were single: Many were living with partners. 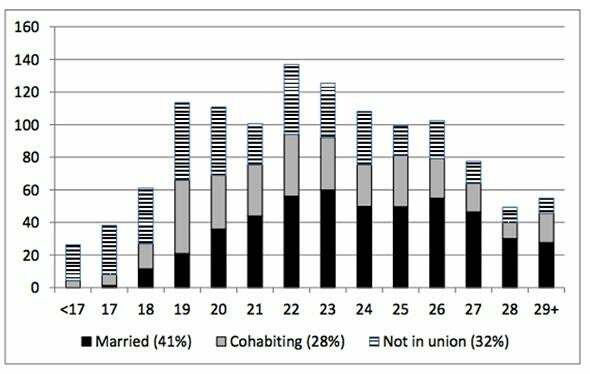 Among high school graduates, depicted in the chart below, for instance, 28 percent of children were born to cohabiting couples. Combine that with the 41 percent of children born to married couples, then most babies were born into two-parent households. The problem is that cohabiting couples don’t always last. Their relationships fare better than parents who aren’t living together at all, but frequently the mother ends up raising a child alone. There are a multitude of reasons why women without a college education choose to have children outside of marriage, which Olga Khazan summed up wonderfully at the Atlantic. Whereas marriage used to be the first step of adulthood, many millennials see it as one of the last, a milestone you reach after financial stability. And while low-income men don’t necessarily make attractive or reliable mates (mass incarceration doesn’t help on this front), poorer women do often see raising a child as something meaningful to which they can devote themselves, especially if they don’t have great career prospects. Those social forces won’t disappear anytime soon, even amid the wrenchingly high rates of poverty that many single mothers face. The conservative response to this web of issues is to say we need to encourage more marriages. But evidence suggests that single mothers who later wed usually end up divorced and worse off financially than before. And as I’ve written, even if marriage promotion is a generally worthwhile goal, the government still has no real idea how to achieve it. So far, federally funded programs designed to encourage matrimony have delivered weak results, and even where they’ve had a positive impact, the change hasn’t been nearly enough to make a significant dent in poverty. 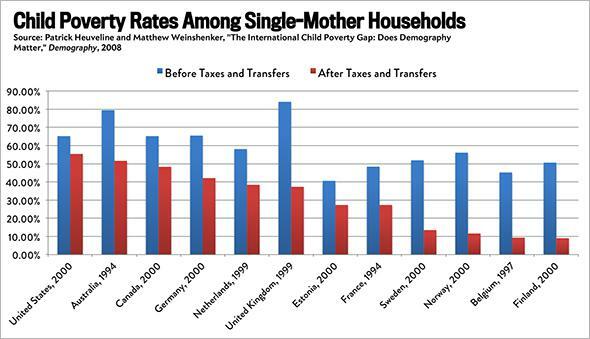 Meanwhile, cutting back on welfare for single mothers doesn’t shrink their numbers. In the U.S., an enormous generation of children is being born out of wedlock. There’s no changing that in the immediate future, and while we can talk about reviving marriage, it’s at best a hypothetical. In the meantime, we know we can do more to help the women raising those kids. The rest of the world has already proved it.